Why will the team in the Evolve game include 4 players? According to the fresh news from Turtle Rock Studios, the teams of the Evolve game will consist of only four players. The creative director of the company - Chris Ashton - has explained to the users why the developers came to the decision of making a limit. According to him, the experience of the Left 4 Dead game has shown that it becomes more difficult to track the team, which includes more than four members. Ashton has noted that most players find it easier to focus on the game when they know certainly where the other three teammates are: for example, the first is near, the second is in front and the third is on your right. Also it’s becomes simple to control the health level and find the enemy. But if the team includes more than four members, there appears a persistent feeling like somebody’s lost or you can’t keep an eye on everyone. Also four players can be divided in pairs for accomplishing two missions. Let us remind you that recently the Evolve game has got several new characters. They form one team to fight against the main monster named Goliath. It’s also worth to note, there were presented four members. So, maybe, this is the complete team? Well, all we can do is wait for fresh news from Turtle Rock Studios, which hopefully will reveal more secrets about the new shooter. And what do you think about such limit of members in the team? What number of players is ideal for you? Share your thoughts in comments. 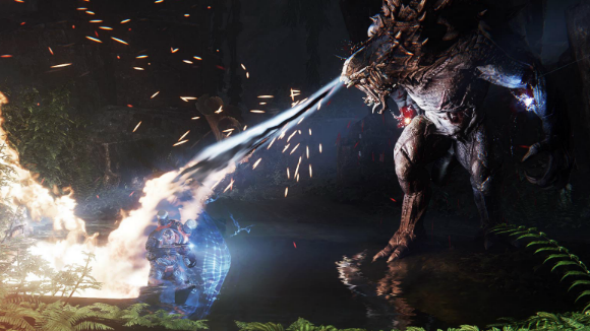 The Evolve game is to be released this autumn for PS4, Xbox One and PC.